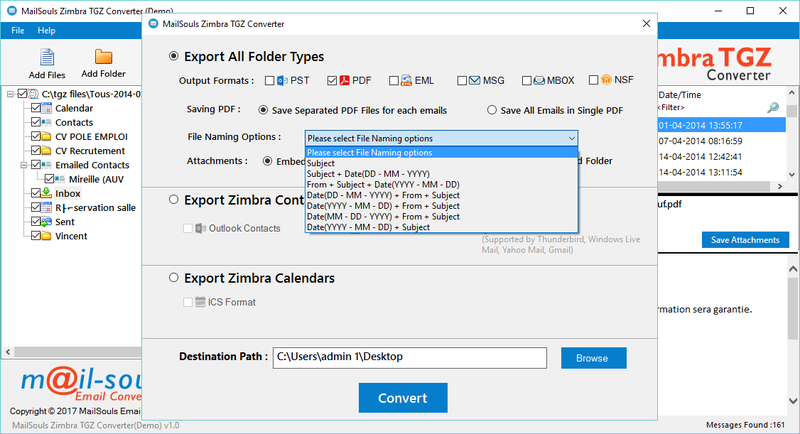 Zimbra TGZ Converter is a strong Zimbra conversion utility to convert Zimbra mailbox TGZ folder to multiple email servers that supports PST, PDF, MSG, EML, MBOX and NSF formats. Zimbra Converter is programmed with friendlier working environment so that all users can instantly convert complete Zimbra mailbox user profile database to Outlook, Live Mail, Thunderbird, Exchange, Office 365, Gmail, Adobe PDF and more. The tool also delivers sub-sections to convert Zimbra contacts and Zimbra calendar. If you are looking to convert batch Zimbra mails into required format, then no need to worry because the application holds Add Folder option using which users are free to convert multiple Zimbra mails into PST, PDF, MSG, EML, MBOX and NSF with attachments including contacts, calendar, briefcase, notes and etc. Another remarkable property of Zimbra TGZ Converter is that the functionality to directly choose TGZ file which eliminates the complete extracting process of TGZ file and folder from Zipped TGZ files at once. No Zimbra or Outlook installation would be needed to convert Zimbra mailbox TGZ folder. Includes Browse button so that users can browse the location and choose the desired destination path to save resultant file. Free Zimbra TGZ Converter download edition is offered so that users can check the working process before purchasing the license key. Demo edition will allow to convert first 20 items from each folder of selected TGZ files to supported file type. Changes: Now performs more instant process. Free of every bug and error.